I’m going to do something a little different thing week, rather than buckle down and write my reviews of Solo and Jurassic World, I am going to spend some time talking through the big event. I’m talking about the Electronic Entertainment Expo of course. And the biggest part of E3 for those of us who can’t attend are the Press Conferences. 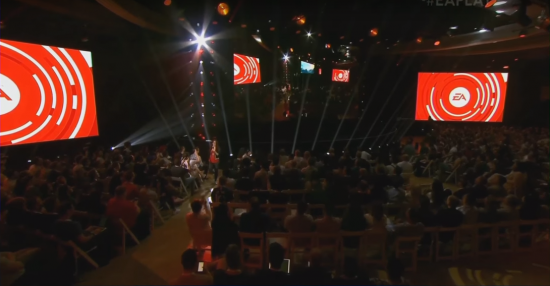 The event kicked off with EA a day earlier than everyone else to talk about their sport games and Anthem. I’m not going to get too deep into reviewing the conference itself, but rather the content on display. For years, these conferences have been an excuse for these publishers and hardware developers to create some kind of road map for the coming 12 months, giving fans (and investors) some confidence in what they’ve got planning in the coming year. So without anymore ado, let’s get into EA’s 2018 press briefing. 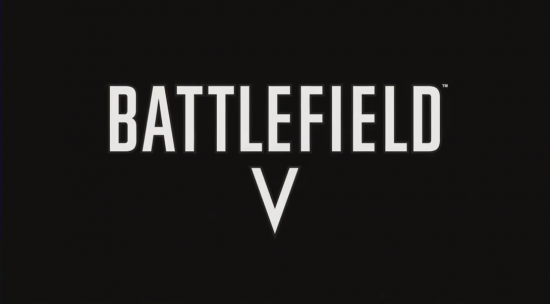 First off was Battlefield V. I’ve personally never played a Battlefield game, but this latest entry is making me pretty interested in finally giving the franchise a try, especially with how much Call of Duty seems to be crapping the bed right now. The segment showed a lot of very pretty stills before actually showing some in engine game play, and I have to say, it looks impressive. The trailer showcased the vehicular and structural destruction that can happen in multiplayer, and the snowy location made the collapsing buildings all the more impressive. Dice make good looking shooters, this continues to be just that. After the trailers, we got a few words from the developers. Keeping the legal dramas over loot boxes in Europe in mind, they said there’d be “No loot boxes, no premium pass”. A statement that was met with some lukewarm cheers. 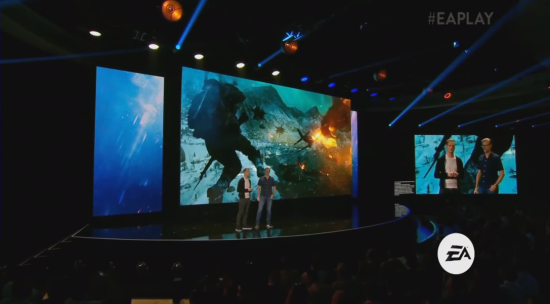 Almost right after that, they announced that Battlefield V would host a Battle Royale mode, something met with sporadic booing, surprisingly. They ended by saying they’d show more during the upcoming Microsoft conference. It was a nice little snippet to let you know they’re making the game, but I get the impressing a larger bulk of the content will be on display at a later conference. Battlefield is pretty much a known quantity at this point and I suppose they don’t need to explain themselves too much in that regard. I like the look of Battlefield V, but I’ll be honest, what they showed here made me interested but didn’t completely sell me on it. We next dove straight into one of EA’s biggest games, and arguably, the one that shows up every year for lip service more than anything. 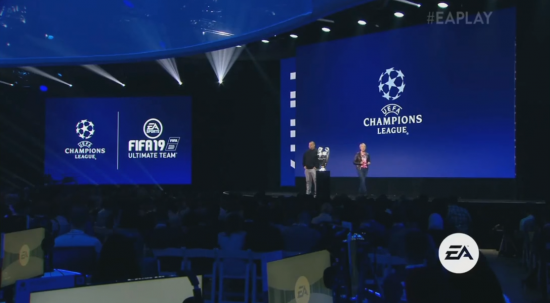 With the Champion’s League Trophy on stage, the speakers revealed that the Champion’s League would be officially represented in Fifa for the first time. I’ll be honest, I didn’t know Fifa lacked the Champion’s League until now. Something to do with Konami losing licences to it with PES probably dying out in the next year or two. Other than that, it was nothing of real substance. I’ll be honest, I haven’t cared about Fifa for a while now, but this presentation felt like they didn’t care a whole lot either. There’s no mention of any changes being made to the gameplay and only a passing mention of the Alex Hunter story mode. Fifa continues to just be Fifa, it’s a game that sells incredibly well for EA every year without them needing to push it in locations like this. It might have been my lack of interest, but compared to years of the past, this felt like a pretty lacklustre showing for the game. A brief segment here talked about EA adding an additional tier of membership to their original EA Access subscription programme. Now, like with the Xbox Game Pass, people who subscribe to Origin Access Premier will be able to download not just EA’s backlog, but will be able to download and play all brand new EA games with just the price of subscription. It seems like good deal to be honest, I might look into it some more when pricing and details become more public. 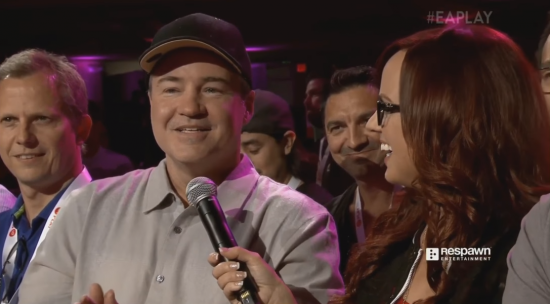 A Dev from Respawn was seemingly accosted by the host in the audience. During this brief chat, he revealed that they were working on a new Star Wars game. He gave very little in terms of real info but said the title; Jedi: Fallen Order, the fact that you would be playing a Jedi and that it was set between Episodes III and IV. Although based on context clues, it seems like it might be taking place shortly after the events of Revenge of the Sith. The game is currently scheduled for a Holiday 2019 release, so it’s still a ways out. I wonder what kind of game it’ll be, Respawn are a bunch of ex-Call of Duty developers who broke away from Activation to make Titanfall, a series I genuinely like. So will this be a first person Jedi game? Or are they trying something new. I like Star Wars and Respawn, so I’ll be keeping my eye on this one. Continuing the talk about Star Wars, we had a developer come out and essentially apologise for Battlefront II. The hot mess around their progression system and loot boxes was big news late last and early this year, to the point they totally changed way it worked. The game is better now as a result, but is one I ultimately fell away from before these changes could go live. It’s a well made and pretty game, just not one I wanted to continue playing. The main new information here was that the game is going to be getting a bunch of new heroes and planets focusing on the Clone Wars era, including General Grevious, Obi Wan Kenobi and Geonosis. I’m probably not ever going to go back to Battlefront II again, but it’s nice to see the game is getting robust support. While micro transactions are a problem, it’s nice to see games moving away from the map pack route that split player bases in the past. Now starts the incredibly earnest indie developer segment. 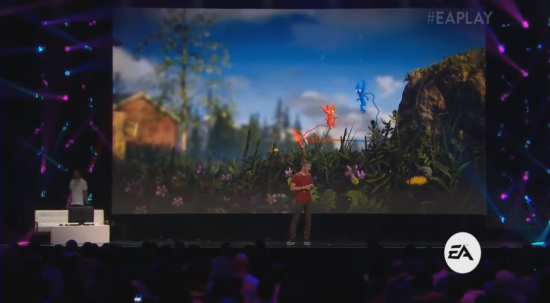 When EA announced the first Unravel, they brought out this very nervous European developer to talk about it. He was very obviously passionate about the game he was making and it showed in the game itself. It was a nice move, one that EA seem to be rolling with this year too. It was enough to make me want to pick up the first Unravel, based on this nice developer on the verge of tears and the very art style the game had. I resist the urge to make a pun about the title, how I stopped enjoying the game as soon as I started playing it, but I ultimately couldn’t play more than an hour of it before I gave up. Unravel looks really nice and obviously has a lot of thought and care put into its story, it’s just shame it didn’t play that well. 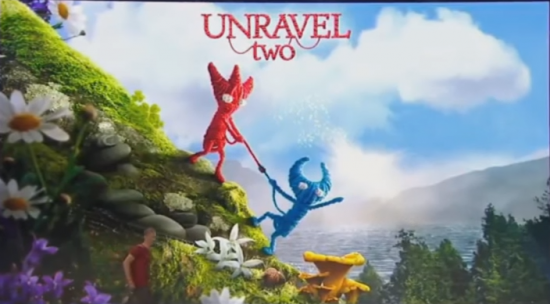 Unravel Two does seem to change things up, adding a co-op element to the game, with A Way Out being cited before the trailer began. There is a neat two man grapple mechanic that seems like a lot of the game play will be centred around. My worry is that the game ends up feeling as loose and floaty as the first game did, which is a crime for a precision platformer. It still looks really nice and the developers obviously put a lot of care and themselves into crafting this story and the meaning behind it. The game section just doesn’t gel with me. Still, I hope it does well for them. Because they did the thing where they announced the game and then released the game at the same time, which is always an excitement generator at these events. While super nervous developer from Unravel seemed a little more collected compared to his last appearance on stage, the developer coming out to talk about new IP; Sea of Solitude, made up for him by getting slightly overwhelmed and needing to collect herself before talking about her game. Again, this seems like a game that has an incredible amount of the developer poured into it. 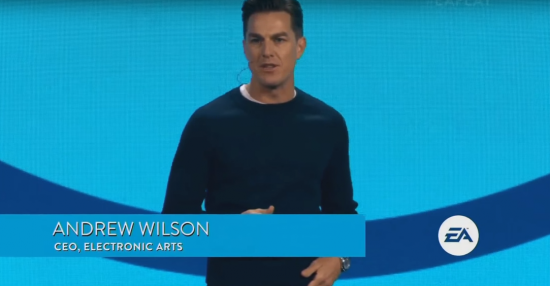 I’m kind of surprised that EA, a company that has been voted “worst company” on a number of occasions seems to be not only funding these small European studios, but also allowing these incredibly earnest leads to talk about them on their E3 stage. 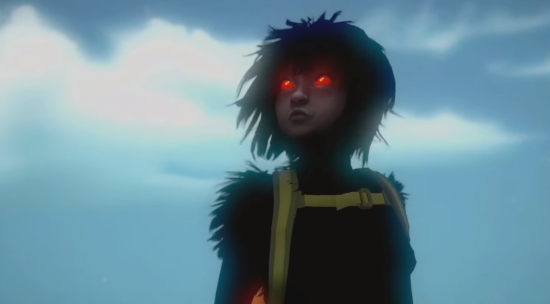 Sea of Solitude is another game that seems to be about reflection of self and dealing with human issues in the metaphor of a video game. They don’t show a whole lot, but what we did see seems very pretty and might have elements of walking simulators and light platforming. I’ll be honest, it’s not the type of game I tend to pick up and play very often. But I only really have positive things to say about what they did show. I’ll probably forget about this one, but I still wouldn’t mind playing it after learning more about it. Pivoting from small passion projects into cold hard corporate interests, the stage then showed a trailer for the new NBA game. I don’t have a horse in this race, I hardly play Fifa and that’s based on a sport I really enjoy. To be honest, they didn’t have a whole lot to say about the game anyway. It felt like a quick snip to show the game existed and then they moved on. No comment on the story mode, something I understand has been a highlight of the NBA games of recent years, for better or worse. It seemed like it was hitting a check box and that was it. Speaking of which, they talk about Madden for a while too. I don’t care about Madden, I’m not even going waste your time pretending to have an opinion here. 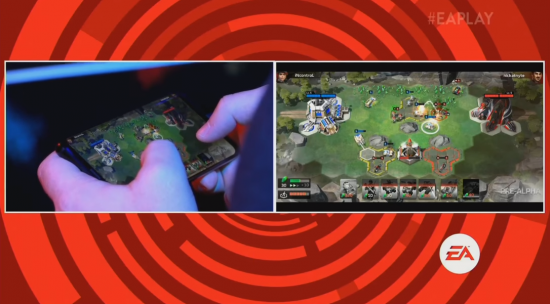 Next began a rather cryptic segments featuring shout casters and professional RTS players showing off a new mobile game. 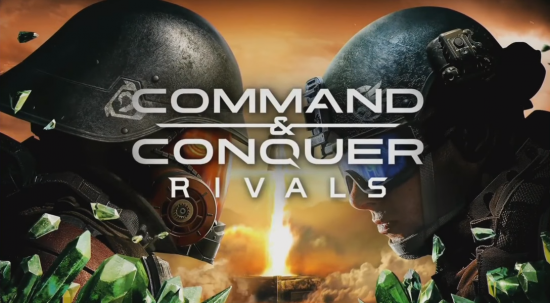 After a live competitive game on stage, the title was revealed to be a mobile focused reboot of Command & Conquer. Right awaty, from looking a the game it reminds me a whole lost of Clash Royale in terms of gameplay. Everything about the game screams “free to play mobile game”, the art style looks like Mobile Strike, the gameplay, as I mentioned, seems like Clash Royale. It has a highly produced and misleading trailer. I didn’t catch if it was a free to play game, but come on, it has to be. The mobile space is huge and EA want a piece of that action. After the trailer dropped, it quickly received a pretty big fan backlash. Bringing back a much loved old franchise and turning it into a re skinned Supercell game rubs a lot of people the wrong way apparently. Personally, I am pretty indifferent. I don’t really have any nostalgia for C&C, or for RTS games in general. I did, however, have a brief flirtation with Clash Royale, which I felt was a very good game surrounded by horrible business practices. I doubt I’ll be playing this game ever. I just wonder if EA can spend enough insane marketing money required to make a free to play mobile game successful. This is the big one, the thing that EA seem to be hanging their hat on this year. And if we’re honest it’s really the last big gasp for Bioware, if we ever want to see another Mass Effect or Kotor again. I’ll just come out and say it, this was a really weak showing. While it was a rather lengthy segment of the press conference, the structure was pretty weird, it felt more like a Q&A than a way to end your briefing, making the whole thing go out with a whimper rather than a bang. The big question going into this conference was “What the hell is Anthem”, after sitting through the whole thing, it’s a question I don’t feel they suitably began to answer. Going in, we knew this was going to be Destiny-like. A open world, multiplayer focused action game. Focused around players flying around the world in Iron Man-esque powered suits. After the segment was over, I don’t feel like they gave viewers anything substantial to think about. 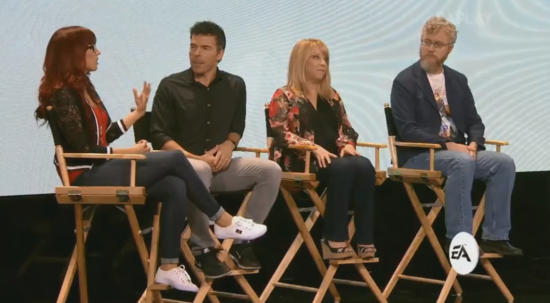 They revealed the names of the four… classes? 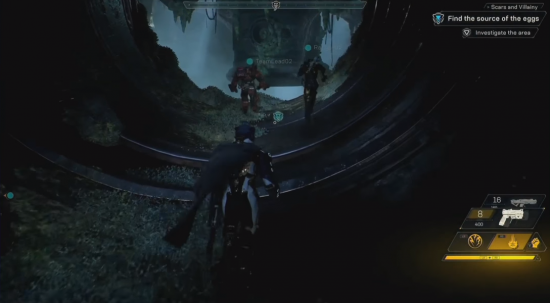 While they show off the Ranger, Colossus, Interceptor and the Storm, they don’t really get into (for example) if these are a choice to make at the beginning of the game or something you can switch in a single play through like a vehicle. There were a ton of questions I wanted answered about the basic functions of the game, the loop, whether its a loot game and what you spend time doing other than jetting around. The developers spent more time reassuring fans that there was still going to be a focus on story. Although they only go into describing it in the loosest of terms, making it all sound like faux-mysticism, using a lot of proper nouns and creating a new science fiction fantasy setting. A whole lot like Destiny actually. I don’t want to sound like I’m being reductive about this game by comparing it to Destiny over and over, but they didn’t give us a whole lot to go on. They did show brief snippets of combat; a third person action shooter with abilities on cool downs and a lot of numbers popping out of things as you attack them, but it’s all still very vague and there continues to be no real sense of what this game is going to be. I’ll say that, at the very least, it looks pretty. The world design is very striking and they showcased a number of nice visual effects including flying through waterfalls and diving underwater. But it lacks substance. The combat itself seems kind of slow and lumbering. I get that these are large mechs, but something about them makes the combat feel slow and slugging. If this is supposed to be a fast paced action game with a multiplayer focus, this gameplay style isn’t doing too much for me based on what I’ve seen. It kind of reminds me Lost Planet. They end the drawn out segment by revealing that the game is due out on the 22nd of February next year. That seems very soon for a game they continue to seem like they don’t have a whole lot to show for. 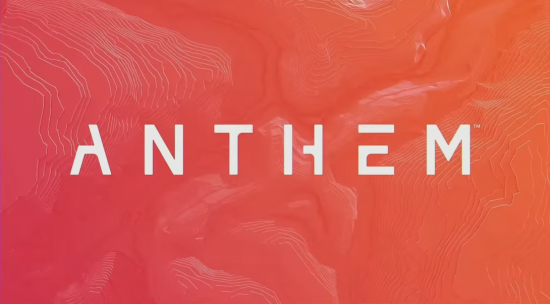 Anthem is still a big mystery to me. I want to like it, but Bioware are doing nothing to dispel my concerns about this game. I hope they show a more complete looking product in the coming months because I am really worried for them. This seemed really light on the ground. When it came to their mainstay franchises, EA didn’t really seem to put any real weight behind showing them off. While everyone knows what their sport games and Battlefield without much pushing or prodding. It didn’t feel like EA wanted to spend much time pushing them at all. It felt like they were getting items off a checklist rather than trying to build hype for their biggest releases of the year. There were good aspects to it. 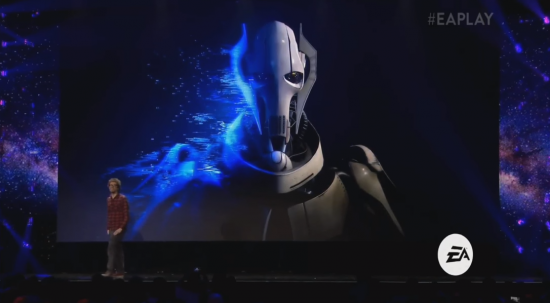 I liked that they seemed to be trying to build some goodwill by apologising for Battlefront II and putting smaller, passionate game developers on stage to show off their projects. But they seemingly throw away all that good will when they reboot Command & Conquer into a mobile game. Something they obviously couldn’t have predicted for but it kind of sums EA up as this corporate entity and undermines the efforts made in showing off Unravel Two and Sea of solitude. Ending with Anthem how they did was a real fizzle. Anthem could be this amazing, huge game if they back it enough. But what was on show felt incomplete and drawn out, like they didn’t have enough to fill their time slot. I didn’t take anything away from this conference that I didn’t already know aside from the title of a Respawn Star Wars game. It doesn’t feel like EA really had anything to say this year. I wonder if that’s a commentary on EA themselves or the changing landscape of E3 and how publishers interact with their consumers. Who needs this event when you can compile a bunch of prerecord footage and stream it on Twitch or YouTube on your own terms. I guess I’ll keep watching these briefings and see if others come across like they still feel E3 is a big thing or not. EA though, not impressed to be honest. It’s a shame, but there was nothing really to see here. Posted on June 11, 2018 June 10, 2018 by WooderonPosted in Features and/or Ranting:, Video GamesTagged Anthem, Battlefield V, bioware, command & conquer Rivals, e3, ea press conference, electronic arts, fifa 19, Jedi: Fallen Order, Madden 19, NBA Live 19, Sea of Solitude, star wars battlefront 2, unravel two. I’m looking forward to this new Star Wars game. It was actually the most interesting thing EA had to say unfortunately. It didn’t feel like they showed up wanting to impress. Even the audience seemed subdued.